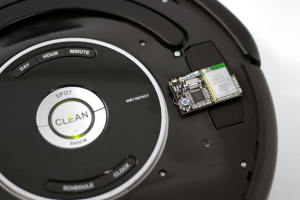 Home › Developing for Roomba? This is for you! Developing for Roomba? This is for you! Roomba Wi-Fi Remote is Robotics, TCP/IP sockets, Ajax, JSON, XML, C, Python, Java… is development. Transparent or Gateway mode, RooWifi, the Wi-Fi Remote for Roomba allows programmers to develop applications for smartphones, tablets, PCs and MAC to communicate with iRobot Roomba without need of any additional cable or Bluetooth or Zigbee. Just need Wi-Fi access. Are you an iRobot Roomba expert developer? Have you programmed the robot with cable? With RooWifi Wi-Fi Remote for Roomba things will be much easier and you will need your home or office Wi-Fi infrastructure. Advantage yourself using the iRobot Roomba mobility. If your application was made in a standard programming language, adapt to the impact of TCP / IP sockets is minimal because the TCP / IP sockets are so widespread as they were once the serial ports and changing code can be done in minutes. Transparent or Gateway mode, Roomba Wi-Fi Remote device manage all the necessary communication to talk with iRobot Roomba. Programmers just need to send commands that affect to the robots telemetry and forget about unnecessary tasks to work with the robot. Forget about the physical layer and just sent SCI commands defined from iRobot Roomba. Totally Wireless! Just close the socket! Leave start working iRobot Roomba and control it with your embedded RooWifi Wi-Fi Adapter for Roomba website through any compatible platform or just leave it in standby. Roomba Wi-Fi Remote has two working modes to communicate to iRobot. By default the robot it’s in IDLE mode or autonomous. This mode doesn’t affect in the normal operation of iRobot Roomba, you can control it through the buttons on the robot. From users point of view, the robot doesn’t change the working modes. From this mode, users will be able to control their robots from the Roomba Wi-Fi Remote Web Server using it as User’s Remote and emulating all the buttons or using it as Driver’s Remote to drive it as a remote control car. Are you a web developer or works with web services? The new Roomba Wi-Fi Remote Wi-Fi v2 incorporates multiple files accessible by URL. Use XML or JSON to perform robot telemetry reading from your web application. Want to push the buttons on the couch? The new version of Roomba Wi-Fi Remote also has URLs with Ajax you can emulate that by pressing the buttons on the robot. And how to boot the transparent or Gateway mode? Roomba Wi-Fi Remote prioritizes TCP / IP to Web Server interaction. There is an application that is connected to the robot and therefore this is the one that dominates the iRobot Roomba. From the connection moment until the time that closing off the TCP / IP socket, you will be connected to the robot. Easy: All you need to do is start the application and connect using TCP / IP socket to port 9001!